The camera can be thrown into any situation, where it can create panoramic images that beam directly to a smartphone. WASHINGTON—The Explorer camera is the size of a softball. And you can throw it like one. The device is a ball with six wide-angle cameras protected by a thick shell, symmetrically positioned around the ball so no matter which way it bounces or how it lands, it can see in all directions. The camera retails at about $1,500. 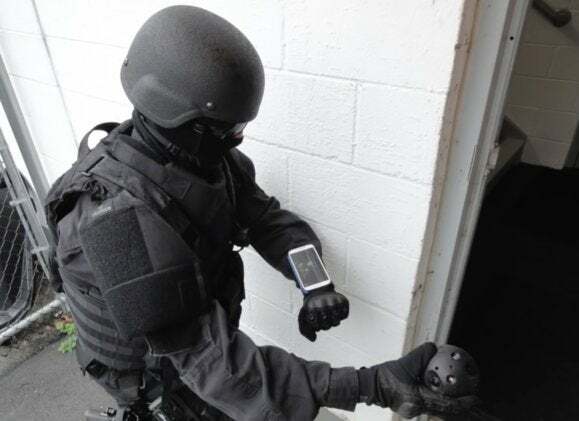 The Explorer is designed to be safer way for police officers to gather strategic data in treacherous situations. As a user throws the camera, it takes pictures every half-second and then instantly stitches together panoramic images and sends them to a smartphone or tablet. The camera ball also acts as a wireless hotspot, with a range pegged at 60 feet, so the mobile device or tablet can quickly download those images. The images are put together in an omnidirectional view—that is, a bird’s-eye view. Alongside the cameras, which capture light in the near-infrared range, are infrared LEDs, allowing the cameras to capture images no matter how dark the areas where the device lands. These features “give a perspective of what goes on in a place so you don’t have to be there,” Aguilar said, a feature that attracted law enforcement interest. The city of Revere in suburban Boston is planning to be among the first municipalities to try one out in its police department. CEO and founder, Francisco Aguilar, started up his Boston-based company Bounce Imaging in 2012. The idea originated from the 2010 Haiti earthquakes. Aguilar wanted to know how someone could respond to such disasters with a low-cost tool. Bounce Imaging expects to release its new product later this month. Aguilar and Aaron Kent, both former students at the Massachusetts Institute of Technology, approached the MIT Director of Facilities Operations and Security John DiFava with the idea in 2012. DiFava sat with the two during the early stages of development. So DiFava put them in contact with different police departments where they got to train with officers and get insider perspective. It can make searches easier “without harming police officers,” the chief said. “The device is a way to the future,” Cafarelli said in a phone interview. Cafarelli acknowledged the concerns people may have when hearing about police using cameras. But he said “spying on people is not the intent of the application.” The purpose of the camera is to be used only for a “specific suspect, specific mission, specific target,” he added.